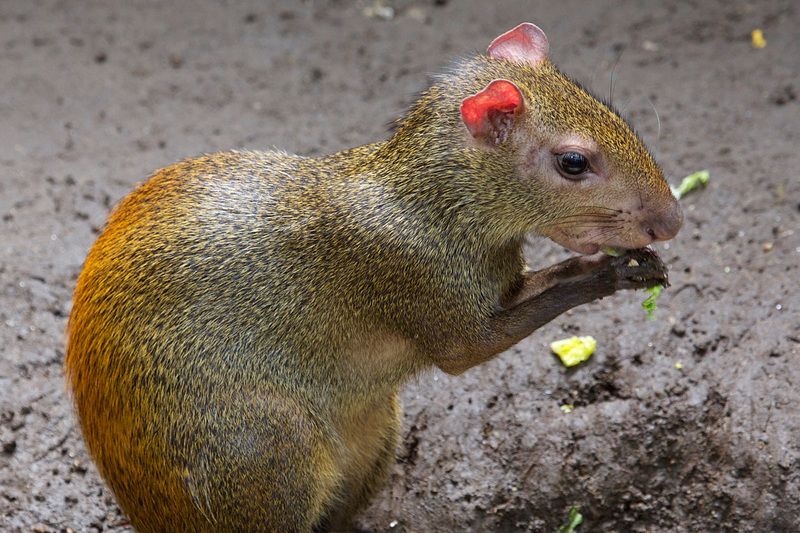 The Red-Rumped Agouti is also called Golden-Rumped Agouti, Orange-Rumped Agouti or Brazilian Agouti. They are similar to guinea pigs but they are larger and have longer legs. They have small tails that range from 1/3 of an inch to 1 1/3 inches. 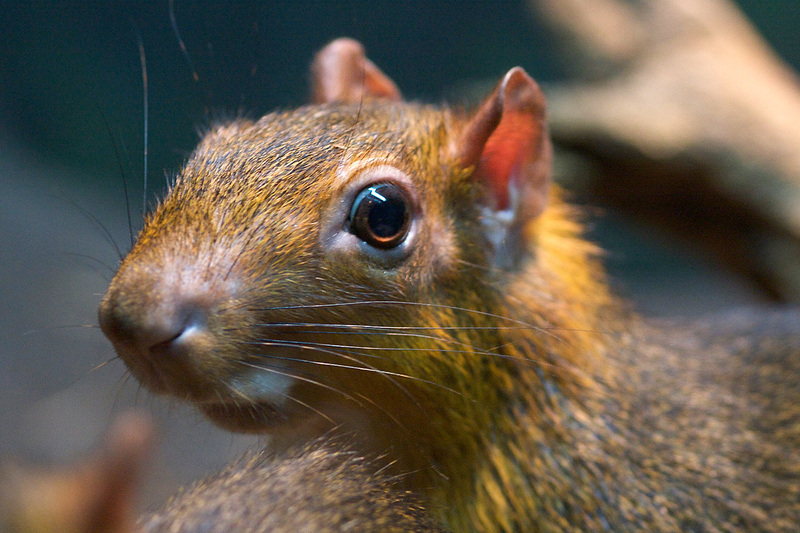 DESCRIPTION: Red-Rumped Agoutis are rodents that grow to about two feet long. They usually weigh on average about five pounds. Their ears are small and somewhat square but they have excellent hearing. Their fur is short and coarse. The coloration ranges from brown to black with a yellowish white underbelly. Their name comes from the fact that the coloration of the fur on their hindquarters is usually a reddish color. Red-Rumped Agoutis like to live near water. They are excellent swimmers. They dig burrows along riverbanks, among limestone boulders and under tree roots. They maintain several sleeping burrows in hollow logs, under trees or under dense vegetation and they leave well-defined paths to the burrows. They can jump straight up almost six feet in the air! Their front feet have four toes on each foot and their back feet have three toes on each foot. They are diurnal mammals but they have adapted to become nocturnal in places where they are hunted for food. They have a range of vocalizations including an alarm bark that sounds similar to a small dog barking. They will horde their food when it is plentiful by burying it in the ground. RANGE: Although originally native to Brazil, they can be found in the wild from southern Mexico to southern South American including the islands of Trinidad and Tobago. HABITAT: They inhabit rainforests especially but also other forests and thick bush land. DIET: Herbivore – fruits, nuts, succulent plants and vegetables. FAMILY LIFE: A male and female Red-Rumped agouti will mate for life. The male is very aggressive toward other males. Females will give birth to one, two or three babies in a litter. Newborn Red-Rumped Agoutis are precocial which means they are born in an advanced stage of development and are able to feed themselves almost immediately. They are born fully furred, eyes open and they are able to run within an hour of being born. Although they can feed themselves they will also nurse for up to 20 weeks. LIFE SPAN: They live on average 15 years in the wild and up to 20 years in human care.